Manufactured of Domestic 200 Denier or 430 Denier Dupont Type 66 Nylon. 3/4 oz. polyurethane coating to provide maximum protection. 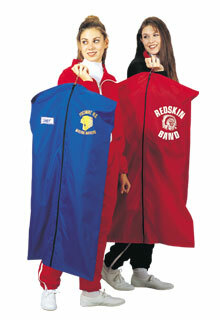 Garment Bags are standard 40" in length with a durable nylon zipper. Garment Bags are available in longer lengths - up to 72", please call for price quote. 200 Denier Colors: Gold, Red, Kelly Green, Maroon, Royal Blue, Navy Blue, Black, Orange, Purple, Forest Green, Grey, Brown, White. 430 Denier colors are Gold, Red, Kelly Green, Maroon, Royal Blue, Navy Blue, Black Orange, Forest Green and Purple. For imprinting there is a one time imprint, art & screen charge per garment bag. For embroidery on Garment Bags, please call for price quote. Optional Accessory Pocket on back of the Garment Bag has a durable nylon zipper closure and will hold up to a size 18 shoe. Delivery on Made-to-Order Nylon Garment Bags is 3 to 6 weeks! Garment Bags prices start at $14.95.